Paradise Town Villa Colm; 20 minutes from the international airport of Antalya, Belek town center by car in 5 minutes(3 km), Kadriye town center by car in 5 minutes(3 km), has 4 spacious bedrooms. 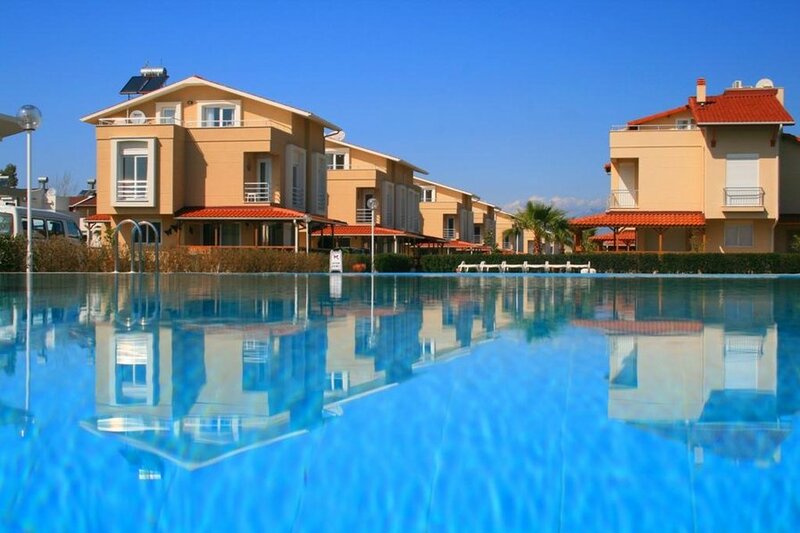 Paradise Town Villa Colm is situated in the Belek region's most eminent complex (Paradise Golf Villas). The villa has 4 bedrooms, each room has air conditioning, shutters on the windows. One of the room is the master bedroom, the bathroom is in the room. There are enough kitchenware. Parking in the garden of the villa. It's free, it does not require a reservation. The villa hasn't got a private pool. But it is the first villa next to the communal pool. You can also use the communal pool. THE PRICE DOES NOT INCLUDE ELECTRICITY CONSUMPTION WHICH IS CHARGED ACCORDING TO THE METERS. The staff will take the meters together with you upon your arrival and departure and you will need to pay for the KWh you used. Paradise Town Villas are built on 48.000 m2 land area. Broadcast satellite (dish antenna). Semi-Olympic swimming pool (525 m2). Tennis Court. Indoor fittnes center. 5 seperate air conditioning in the villa. Pvc Plings. Double way through the park. Hiking trails on. Automatic garden irrigation. Tile roof. 24 Hours Security and Camera Systems, Children s Playground. Belek is a tourism center in Serik district in Turkey's Antalya Province. The local population varies between 750 and 10,000 in low and high season, respectively. Belek is one of the centers of Turkey's tourism industry and is as such home to more than thirty four-star and five-star hotels and many other accommodation, services and entertainment facilities. Belek is a developing golf center. In 2012 it hosted the Turkish Airlines World Golf Final and in 2013 it hosted the Turkish Airlines Open. The Kurşunlu Waterfall is a place in Belek. There are over 100 bird species living by this natural wonder. The hidden cave at the back of the waterfall is a popular place for visiting. Near Belek there is the Hellenistic city of Perge, which is rated second after Ephesus and the great amphitheater of Aspendos that still today can hold over 15.000 spectators. The ancient Aspendos amphitheatre holds 20,000 people, is over 2000 years old and still hosts open- air classical, ballet and opera festivals today. The Roman ruins at Perge are some of the best preserved archaeological sites in Turkey. Side is one of the best known classical sites in Turkey.